Not usually the sort of band whose latest release I'd rush to check out, Sweden's long-running Necrophobic have nonetheless outdone themselves here. Dropping Tobias Sidegard after a domestic violence incident and returning to Nocturnal Silence-era vocalist Anders Strokirk was something of a stroke of genius; Strokirk's harsh snarl fits in perfectly and from the Necrolord-penned artwork alone you'd think the band have returned to their classic period. Musically, Mark of the Necrogram is more than solid, that post-Dissection sound mixing with influences like God Dethroned and At The Gates to make for a melodic yet still very heavy outcome. Even catchier mid-paced tracks here like Tsar Bomba have plenty of compelling guitarwork underpinning the hooks and never descend to mere melodeath. And the black metal elements are still very important to Necrophobic, the album opening with the blackened flurry of the title track, going hard from the first few seconds and doing so well. Where the album succeeds so well is in mixing it all together, however. Each song present is well written and put together, the added groove given the likes of Odium Caecum and Lamashtu inviting younger fans who grew up on, say, Goatwhore to appreciate the formula here, which is easy to sum up as Slayer + Maiden + Satan but has a little more to it in practise! There's a touch of latter-day Immortal, for example, in the groovy infectiousness of Sacrosanct, those widdly solos and melodic leads achieving the sort of spiritual impact and atmosphere that other black metal bands have with tremolo riffs. And as the snarled 'oooh-ah' interrupts the dark spell that the guitars have cast on you in the beginning minute of Pesta (re-recorded for this album from last year's EP) it's hard not to be impressed by how seamlessly Necrophobic have combined the worlds of death and black metal. The likes of Crown of Horns (not a Cryptopsy cover) speed up for the blackened chorus and slow down hardly at all for the more deathly verses, and it never feels like the band are extending themselves or trying to fit a square peg in a round hole. 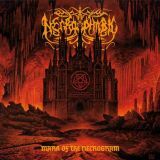 Mark of the Necrogram is thus something of a killer album, if not quite the instant classic that it first suggests itself to be. The closing duo of From the Great Above to the Great Below and outro Undergangen are a little less compelling than the rest of the album, for one, ending on a bit of a damp squib rather than the nuclear detonation that seemed to be building. It's also hard to escape that this is all yet another Necrophobic album, the type that they've been making every few years; those that have followed the band closely may even be less impressed than a recent re-discoverer like myself! Yet there's no denying that this is a good album, a more than solid slice of deathened blackness that isn't afraid of metal's essential riffs and ridiculousness. Great stuff, sure to appeal to all and to restate Necrophobic's mastery of their craft.